SEBI researcher Theodora Tsouloufi has been looking into disease diagnosis tools for animal health: what tools are currently available, what are their main offerings, and how these have been put into practice? One of the ways the Supporting Evidence Based Interventions (SEBI) programme works to deliver ‘better livestock data for better smallholder lives’ is by evaluating already-existent and new technologies. The goal is to gain a better understanding of what tools and technologies work best to improve livestock health and productivity, and under what conditions. In low- and middle-income settings, livestock health data are the foundation for improving livestock production, as they enable researchers and policy makers to set evidence-based priorities and make better decisions. However, field data collection in these areas has many pitfalls, such as poor sampling, erroneous data entry, badly designed surveys and misdiagnosis of diseases. Improving diagnostic quality is a challenge that researchers grapple with in the battle for better data. When it comes to diagnosing livestock diseases, Diagnostic Decision Support Systems (DDSSs) show promise in facilitating disease recognition and differential diagnosis in clinical or field settings. These include manual (books or diagnostic charts) or digital (app/software)-based systems, which can improve diagnostic accuracy and speed of diagnosis, minimise potential diagnostic errors, and thus improve the efficiency of veterinary service delivery. These tools exemplify evidence-based interventions in practice, as they provide support for clinical decision-making. Disease diagnosis tools have aided identification in the field, but are these tools being actively implemented in Sub-Saharan Africa countries? The SEBI program has been looking into the relevant DDSSs in the market and literature; here are some of our top findings, with descriptions of their basic features. Note: Content might differ as the company’s site is currently not available-data were gleaned from internet searches. 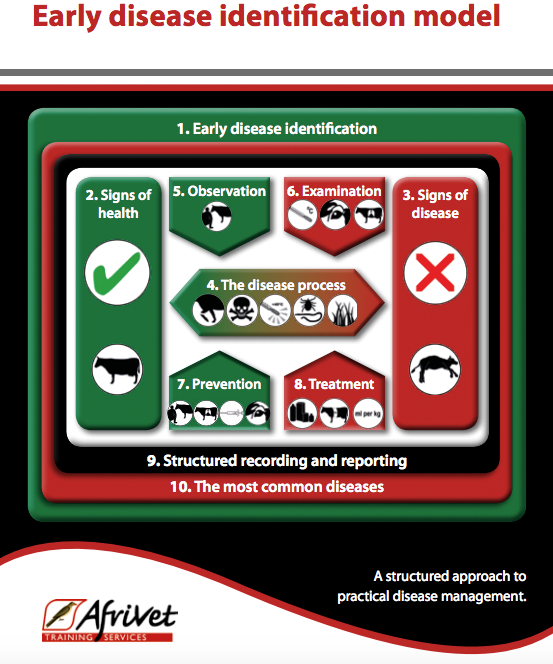 Afrivet’s early disease identification model. Source link. Pros: Scoring algorithm to assess relative disease likelihood, colour coding and numbering for rapid identification of disease-sign linkages, simple and low-production-cost tool. Livestock DDSSs: a boon or a bane? The livestock community has had a rather mixed response to DDSSs. Despite their efficiency, DDSSs seem to have a poor adoption rate in medical clinical settings in Africa. As field trials are scarce, the relevant adoption rates in veterinary settings have not been estimated so far, although they have also been perceived as poor (Cockcroft 2003). Other commonly expressed considerations have to do with clinical data entry or knowledge management, the difficulty in diagnosing multiple or non-typical disease presentations due to the non-adaptive character of these tools, as well as with social or infrastructural issues (e.g. internet or mobile-phone accessibility, network coverage). On the other hand, as veterinarians might not be available on-site, health technicians or even farmers using these tools could be a first point of disease recognition and reporting, supporting syndromic disease surveillance. Importantly, DDSSs could possibly hold value as data collection systems for research purposes or even help to build up knowledge around disease diagnosis and transmission in Sub-Saharan Africa countries. However, wider implementation and research is needed, in order to draw reliable conclusions. Do you know about other livestock DDSSs that show promise, or have been used successfully in Sub-Saharan Africa? Please share in the comments section. Theodora Tsouloufi is a researcher with the SEBI Programme, based at the University of Edinburgh. She has a PhD in Veterinary Clinical Pathology. Header image: Livestock in Bako-Shambu, region in west Ethiopia. Photo credit: A. Habtambu, ILRI (source).